Home / County Politics, News / RAILA is indeed the boss! See how he walked into the AU summit in Ethiopia with his bodyguard while UHURU’s ADC and PA were locked out? RAILA is indeed the boss! See how he walked into the AU summit in Ethiopia with his bodyguard while UHURU’s ADC and PA were locked out? 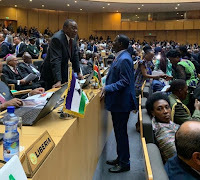 Monday February 11, 2019 - A protocol blunder during the African Union (AU) Heads of State summit in Addis Ababa, Ethiopia, has left Kenyans with many questions. This is after President Uhuru Kenyatta’s Aide-de-Camp, Lieutenant Colonel Timothy Stelu Lekolol, and his Personal Assistant (PA), Jomo Gecaga, were locked out of the summit after a scuffle with Ethiopian security. In a clip that was shared on social media on Sunday, Uhuru’s bodyguard in his official regalia and Jomo Gechaga are seen pushing through a crowd while trying to access the hall only to be locked out. They were forced to walk away in shame and disbelief. And as they were walking away, Ugandan President Yoweri Museveni and former Prime Minister Raila Odinga, who is also the AU High Representative for Infrastructure and Development, arrived with their bodyguards and PAs and were allowed to walk right in as though they were the bosses of the summit. No one even stopped Raila’s bodyguard and PA like they did to Uhuru’s. It is not clear why Gechaga and Lekolol were barred from the summit. those were joy riders blowing our taxes on useless AU summits. Enter your comment... It was a mistake which will not be repeated at all times. Our president is there on merit.He is God chosen leader.